Maximilian Hofmann studied Business Administration (B.A.) in cooperation with the Commerzbank AG in Frankfurt/ Main, Germany. 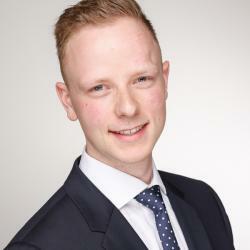 During his study program he made several internships at private banking, asset management and corporate banking. Afterwards he started at the securities advisory for business clients in Frankfurt. Currently he is enrolled in the Master of Finance ‘16 program. 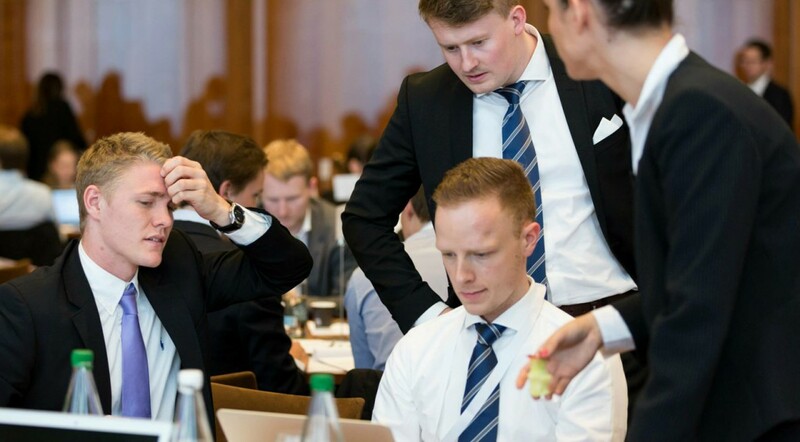 Business Game St. Gallen – three days sponsored by Frankfurt School – sounds like the best way to have a sponsored vacation trip. Wrong! Three days of hard work and fun to fulfil the expectations of our program directors. In 2014 one of the Frankfurt School teams won the business game and we are the next to represent FS in St. Gallen. The expectations were high and we made our best to meet these expectations. But how did it start? After our application and the confirmation for the Business Game, we made a first briefing at Frankfurt School. The winning team of 2014 held a presentation about last years BG. It sound interesting and fun, but on no account easy. Thursday was arrival day, the Business Game started with an amazing Welcome Dinner. In a relaxed atmosphere, we had the chance to get in contact with our peers and the company representatives. Students from whole Europe and several different universities came to participate on the Business Game. The CEO of BDO Swiss hold an Opening Speech to us and powered us to give our best during the next two days. Friday started early in the morning. The first case study started at 8 am and we were faced to the CSR Challenge of Nespresso. In the first challenge we had to make more than the expired PowerPoint presentation. Next to the PowerPoint presentation we had to create a film, how we want to implement our idea. In this first challenge we got to know that four hours are running faster than we all thought. After the lunch the next Case Study already started. Swarovski gave us a marketing challenge. We analysed the revenue and growth potential of the several income sources. We found out that Swarovski has got a few product lines, which are quite good, but not profitable. We build a presentation, in which we made a recommendation, which division should be divested and which division should be implemented and improved. The last case study on Friday was the pitch challenge of BDO. BDO provided several information on this, and we only had two hours to work on it. We were asked, whether we should make an investment. Is it a positive investment? And is the investment feasible for the company? Two hours were short, but it was feasible, like the investment, but not for the over indebted company. The day ended with a great walking dinner, we had the opportunity to revue the cases, talk with our teams, peers and of course with the representatives of the companies. Last but not least, Zurich provided also a case study on Saturday. The strategy challenge was quite challenging, in the last cases we missed some information, now we had the feeling to have to much. But my team and I made a good job. We divided our work quite well and finished the presentation 20 minutes earlier. One and a half days solving cases, but afterwards we had to fight for our ideas. In a strict timetable we presented with our caseteams our ideas and gave our best to convince the jury of company and university representatives of our ideas. At the evening the jury made their decision, which teams are in the semi-final. In the semi-final four teams participate on the Eloquence Final. In a six minute argumentation, the teams had to fight for their opinions. This year the FS did not reach the semi-final. But nevertheless, the jury pronounce the first, second and third place of each challenges. Johannes Mueller, my teammate, and I made the second place of Swarovski. Jonathan Bassenge and Henrik Johnsdorf made the third place of Swarovski. Melanie Alvarado and Carlos Moreno made the first place of the BDO Pitch Challenge. After the announcement of the case winners and the Business Game winner, we all celebrated by a last walking these two amazing and exhausting days. Afterwards, we all partied and had a great night. In conclusion, I am very happy to had the opportunity to go to St. Gallen. We had a lot of fun, we faced new problems and situations. We had to coordinate four team partners to solve four challenging cases in just four or even two hours. We all improved our skills and are looking for the next chance to represent the FS.